Emerald Willowtail lay sleeping under a mushroom. Her light brown hair wrapped around the bottom of its thick, creamy-colored stem. She had stuck white daisies with big yellow centers into the tawny strands of her hair before she’d drifted off to sleep. She’d picked them from the hidden glen she was now lying in. She was dressed in lime green, bright and colorful. Buttercups, tiny violets and bluebells sprung up amid the tall, waving grass. Emerald didn’t notice the white butterfly as it landed on the reddish-brown mushroom cap above her. 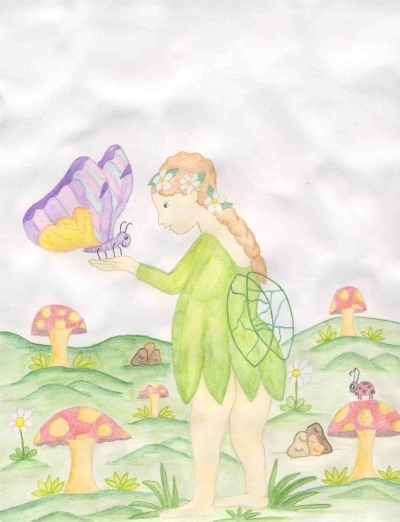 Brooke, the butterfly, bent over and looked under the mushroom. Her long antenna nearly reached the ground. She spotted the sleeping fairy. Brooke knew the rules of the glen. If you caught a fairy, she had to grant you a wish. Brooke fluttered to the ground and landed next to Emerald. She began to shake her. "Wake up. Wake up," she said. Emerald opened her eyes and looked at the butterfly. "I caught you. Now you have to grant me a wish," Brooke said. Emerald stood up. "That is the rule of the glen," she uttered, not arguing at all. "What wish would you like?" she asked. Brooke thought and thought, but didn’t know what she wanted. Emerald, being a wise fairy, knew that Brooke needed guidance to make the right choice. "See the buttercups. They are the color of the sunshine. Just looking at them makes me feel warm inside. Do you feel it?" Brooke answered, "Yes. The buttercups are happy flowers." Emerald continued, "See the purple violets. When I touch them, they feel like soft velvet and smell sweet, like perfumed honey. Do you smell that? Can you feel that?" Brooke touched the violet with her antenna. She bent over and smelled them. "Yes. The violets are sweet, like honey, and soft, like the feathers of a baby bird." "See the bluebells. They wave back and forth in the gentle breeze. If you listen, you can hear them ringing; chiming like the bells in a church tower," Emerald said. "Can you hear them?" Brooke listened. The bluebells, tiny and clustered, rang and tinkled as the breeze blew them together. "Yes. I can hear them. They sound like tiny pieces of crystal clanging together." "See the primroses. They are pink and fragrant. Their nectar is delicate and delicious. Can you taste them?" Emerald questioned the butterfly. Brooke fluttered over to the primroses. She put her proboscis into the center of a pale pink rose and sipped its nectar. She fluttered back to the fairy. "Yes, the nectar tastes sweet, delicious and delicate." "Your wings are as white as the snowflakes that fall to the ground in winter. You could use your wish to be as all the flowers," Emerald suggested. "I want to be like them. That is my wish," Brooke said. "Close your eyes," Emerald said. Brooke shut her eyes. Emerald took out her tiny wand and went from flower to flower, touching each one. She flew over to Brooke and touched her wings with the wand. Instantly, her wings turned yellow, like the buttercups, purple, like the violets, blue, like the bluebells, and pink, like the primroses. "You’re beautiful. Open your eyes." Brooke looked at her wings. They were beautiful. A tear ran down her eyes and landed on the ground. Immediately a beautiful, white snowdrop appeared. "How did that happen?" she asked. "The white from your wings wasn’t wasted. I sent it into your tears. Whenever you shed a tear, a snowdrop, white and sparkling, will appear. It is my gift to you and to nature. Enjoy your new colors and never forget where they came from," Emerald Willowtail said, and then as quickly as Brooke could blink another tear from her eye, the fairy disappeared. Brooke wept tears of gratitude all over the glen. To this day, the small, hidden glen is known as Snowdrop Glen.